As Mackinac Center analysts have noted elsewhere, Medicaid comprises nearly one of every three dollars spent by the state of Michigan — 30 percent of the state budget — and is growing at an unsustainable rate. If Medicaid eligibility is expanded, an estimated 29 percent of new Medicaid enrollees will be individuals who previously had private insurance and dropped it to enroll in public coverage. Thus, Medicaid is an inefficient way to reduce the number of uninsured. Limited provider participation in Medicaid creates a significant barrier to health care access for Medicaid enrollees. As a result, although Medicaid seemingly offers a generous benefit package, coverage does not guarantee access to needed services. A substantial body of research shows that Medicaid patients are more likely to rely on hospital emergency departments to obtain the care they need. Without access to appropriate primary and specialty care, Medicaid patients often experience worse health outcomes compared to people with private insurance. Many potential Medicaid enrollees targeted by the proposed Medicaid expansion will have access to federally subsidized health insurance options on the ACA’s health insurance exchange. The cost of insurance premiums to the participants would be a small fraction of their income, and in some cases (as with the bronze plan), the premiums might even be fully subsidized, limiting participants’ costs to the health care spending not paid for by the plan they selected. In either case, the participants would be in a situation similar to that of many Michigan residents already covered under private insurance. For at least some of the low-income uninsured, Medicaid is not the only insurance option. 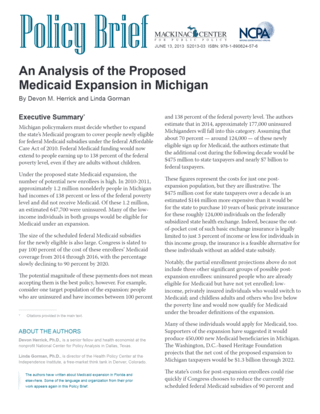 But faced with large potential federal subsidies for Medicaid expansion, state policymakers may easily underestimate Medicaid’s downsides on the one hand and the availability of practicable alternatives on the other. Indeed, given Medicaid’s current share of the state budget, its shortcomings in serving its present population, and its significant, unpredictable costs under the proposed expansion, policymakers have sound reasons to be wary of enlarging the program. Does Medicaid Boost the Economy?